It is hard for me to believe that this year is almost behind us and 2019 fast approaches! What happened? Where did spring,summer and fall go? One moment I am painting in my warm art studio with my furry muse, pictured here admiring his "selfie". ...and then this year seemed to whiz by me at super sonic speed! 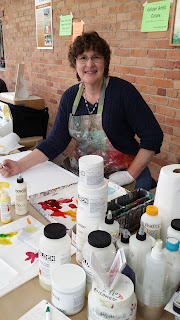 It has been a busy & creative year! 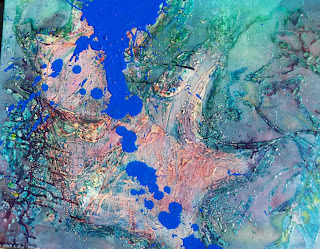 Jam packed with exhibitions, art classes,workshops, demonstrations. 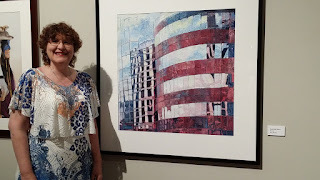 Elise at her 2018 solo exhibition sponsored by Dodson's jewelers. 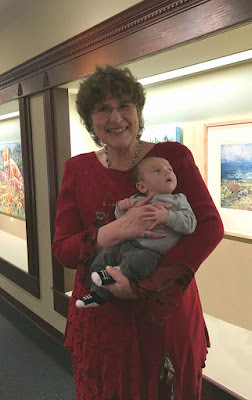 Shown here visiting with her grand nephew Aidan,who is 7 week old and is checking out his first art show. 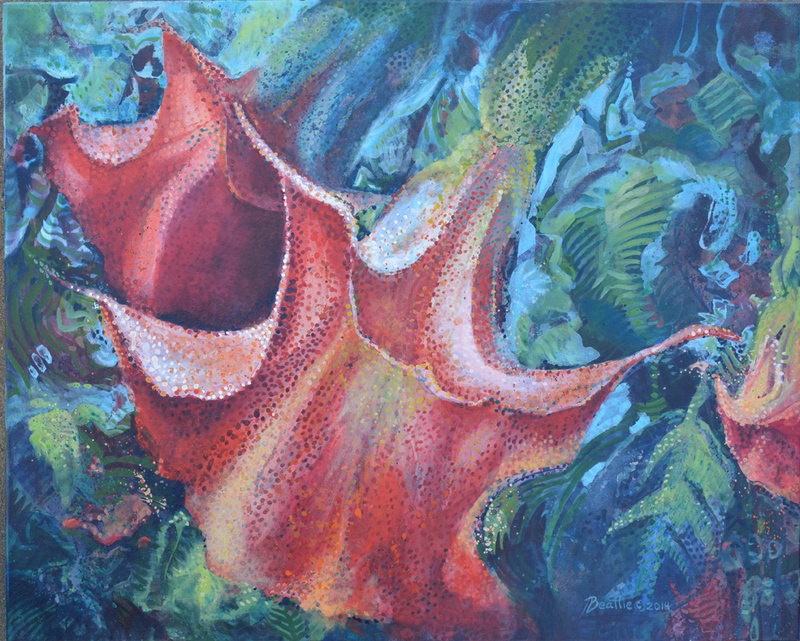 I started this year with a solo exhibit at the prestigious Dodson's jewelry & art gallery in Spokane, WA. The opening reception was a joy filled evening culminating after 6 months of work creating 22 new paintings just for this exhibit. 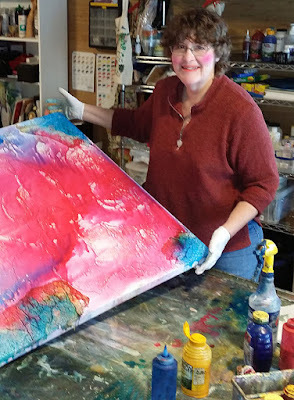 In all of the mixed media paintings, I used my favorite Fearless Techniques of pouring watercolors and finishing with fluid acrylics and collage. 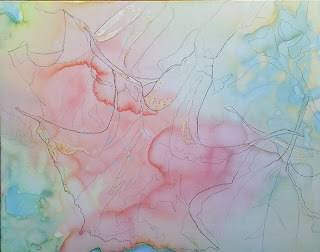 First pour of watercolor paints onto my painting. The first pours leave me with an array of many wonderful blended hues. My second pour begins the process of creating a range of dark values. 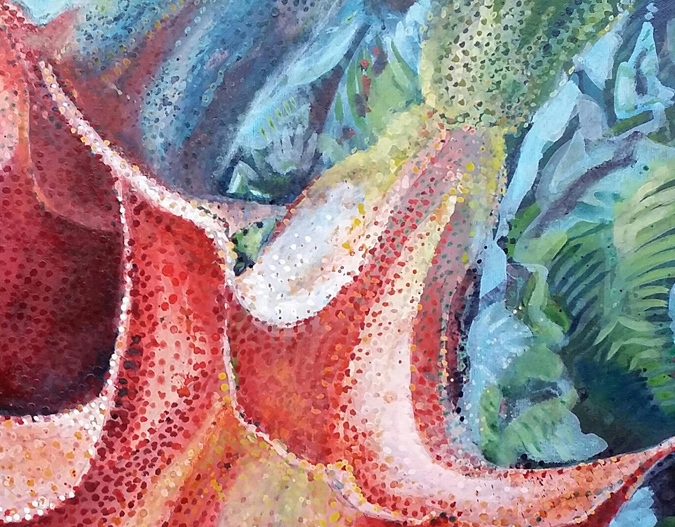 A close - up of my finished painting. 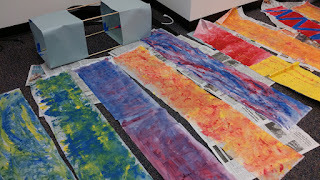 As you can see,from this close up,my acrylic paints are used to create unique patterns and textures. 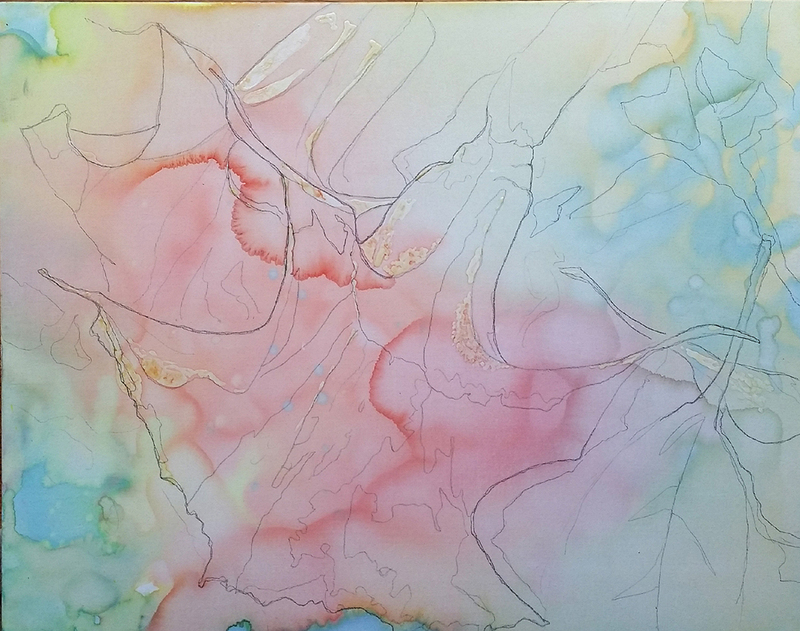 24 x 30 poured watercolors & fluid acrylics on canvas. at Spokane Community College. 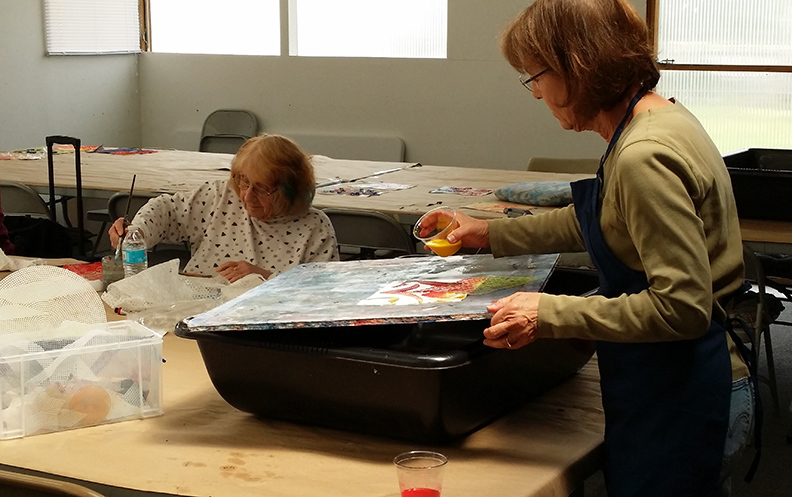 In this photo students are finding fun ways to learn how to paint with acrylics and try out creating abstract art. 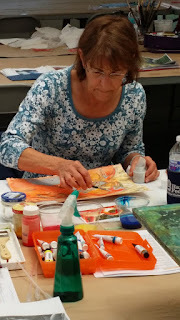 Currently, I am teaching a Fearless Watercolor Painting class. SCC "Courses for fun" painting classes! Inspiring young minds during the summer months at the Spokane Community College's "Kid's College" was one of my favorite programs to teach this year. In this week long summer program we made & painted our own box kites and created papier mache masks. 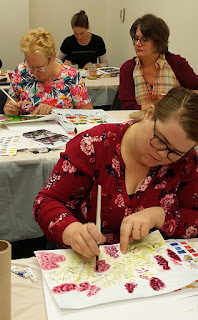 This year's my 3-day "Inspirational techniques for Fearless Painting" at Spokane Art Supply kept me swimming with students in fluid colors as we all tried out pouring paints! pouring transparent watercolors onto watercolor paper. 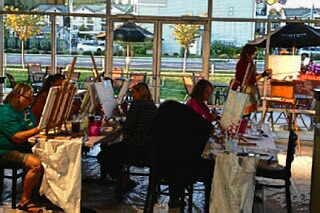 Keep an eye out for more Fearless Painting workshops coming to Spokane Art Supply very soon! 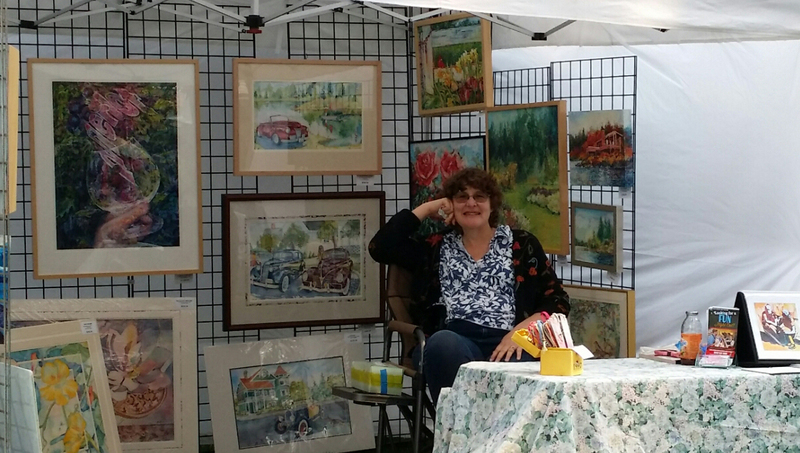 Teaching at the Fair for "Painting with a Twist"
This summer, I even taught a painting class at the Spokane County Fair and had a booth at the Arbor Crest's Art and Glass festival! 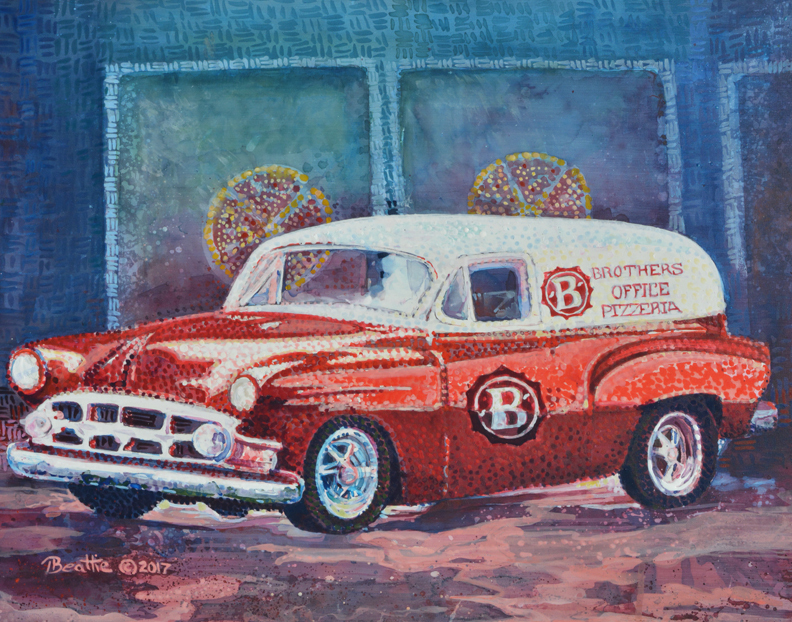 Did you know that you can find my art on exhibit and for sale in Spokane Valley's at all three locations of The Brother's Office Pizzeria? Come enjoy dinner and my art at these wonderful local bistros as you think about which painting you would like to purchase and drive home with! Fun evening events are now also being sponsored by my friends at the Brother's Office. In September I taught the first annual "Pizza and Paint" night. Patrons enjoyed fresh baked pizza as they painted their own masterpieces. 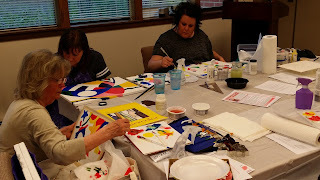 Many more pizza and paint classes are being planned for 2019. 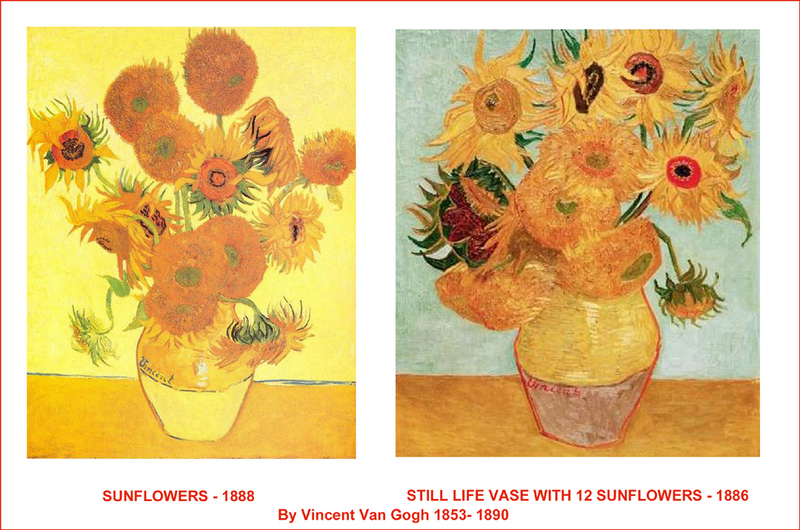 Please visit my art class web page for more information. Once again his year, I had the marvelous opportunity to demonstrate my favorite acrylic painting methods as I represented the Golden Paint company During the demos I shared tips for painting with Golden acrylics and mediums on paper, canvas, fabric and wood at Spokane Art Supply's annual Great Art Adventure! Yes, in deed it has been a busy year! Until September that is, when a minor accident put me on the side lines. Now, I sit at my computer contemplating the change of weather. 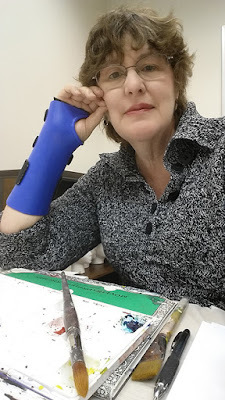 I am writing this blog, impatiently, waiting for bones and ligaments to heal so that I may resume my creative activities in comfort. In the mean time, I learn new ambidextrous techniques as I attempt to teach & be creative with only my left hand! Note to self: Just say "NO" to falls & fractures"! 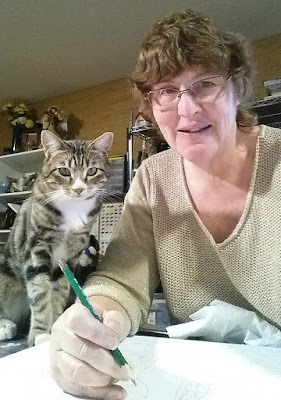 Thank you my friends for checking in with the Fearless Artist and this blog. 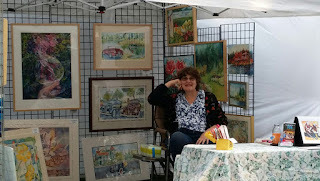 I invite you to visit my website at Beattie Art Works to see more of my artwork or stay in touch with me through my Facebook page. If you are interested in watching my art videos please check out my Elise Beattie YouTube site for art videos about my work and techniques. 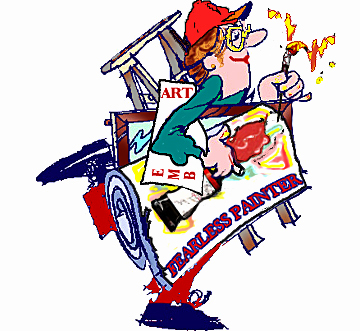 Are you interested in becoming a fearless artist? 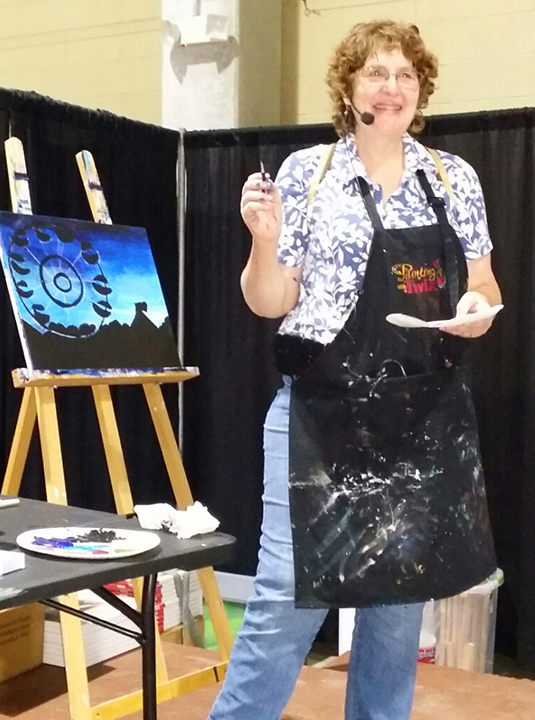 Please feel free to contact me if you would like to learn about my future fearless art classes and events. Look for my contact form on this blog.